Scores of media professionals have been detained amid the government's post-coup purge. Turkey has become the world’s biggest imprisoner of journalists. In the wake of a failed military coup on July 15, 2016, that threatened President Recep Tayyip Erdoğan’s power, his regime has waged an “unprecedented purge” of critics, citing supposed national security concerns as a pretext for mass arrests and newspaper closures. At least 2,500 media professionals in the country have lost their jobs, and more than 160 news outlets have been shuttered since the attempted takeover, according to Amnesty International. By late 2016, two-thirds of all journalists detained worldwide were imprisoned in Turkey. Scores of reporters have personally fallen victim to the post-coup purge and crackdown on dissent in Turkey, where a simple tweet, cartoon or poem can mean incarceration. As of December, according to the Committee to Protect Journalists’ latest numbers, at least 81 members of the press had been jailed in Turkey in direct retaliation for their work. Dozens more have fled the country out of fear for their safety, at a time when the Turkish people need a free, functional press perhaps more than ever. “The coup attempt provided the government with the perfect opportunity to go after any critical voice and any opponent under the pretext of defending the state and national security,” Nina Ognianova, the Committee to Protect Journalists’ Europe and Central Asia program coordinator, told HuffPost on World Press Freedom Day in May. Erdoğan himself declared the failed coup “a gift from God” days after it happened. His government’s sweeping powers have been further fortified by a narrow victory in last month’s constitutional referendum. Erdoğan can now call a state of emergency and govern by decree at any time, without seeking approval from lawmakers. U.S. President Donald Trump, who shares Erdoğan’s antipathy toward journalists, congratulated the Turkish president on the outcome of the referendum. Journalism is not a crime. But more than 170 media workers are detained in Turkey today. One year after the failed coup, HuffPost shares the stories of eight journalists locked up in Turkish jails ― simply for doing their jobs. Prominent Turkish journalist and author Ahmet Altan (above, left) and his brother Mehmet, a distinguished economics professor, journalist and author, were seized during a raid in September. They face possible life sentences. They are accused of “sending subliminal messages” to coup plotters during a television broadcast. Ahmet Altan was briefly released, but was detained again over allegations of attempting to overthrow the government and belonging to a terrorist organization. “I am facing a horrifying accusation, for which there isn’t a shred of evidence,” Ahmet Altan said, according to Amnesty. He called the allegations “nonsense” in his defense statement last month. Veteran Turkish journalist Kadri Gürsel has been imprisoned since late October with eight other media workers. He is accused of terrorism offenses for a column he wrote shortly before the failed coup, and of supporting Fethullah Gülen ― the coup’s mastermind, according to Erdoğan. But such allegations make little sense to Sedat Ergin, a columnist and former editor-in-chief of the Turkish newspaper Hürriyet, who worked with Gürsel for years. Gürsel’s wife, Nazire, told Amnesty she has been struggling to explain the situation to their young son. Prominent Turkish television reporter and former member of parliament Nazlı Ilıcak faces possible life imprisonment in Turkey without parole. She was arrested in Turkey in late July, and questioned amid allegations of “attempting to bring down the government,” producing “propaganda for a terrorist organization,” and being affiliated with the Gülenist movement. Ilıcak, 72, once lost her job at the pro-government newspaper Sabah for criticizing the government, PEN America notes. She has maintained her innocence while in custody. She denied the “offensive” allegations in court on June 19. BirGün daily newspaper journalist Mahir Kanaat was arrested on Christmas, along with six colleagues. The journalists were accused of having connections to an organization suspected of hacking a Turkish minister. They were reportedly denied access to lawyers for several days. Kanaat’s son was born while he was detained. His trial is scheduled for October. Erdoğan has come after celebrated graphic artist Musa Kart several times for what he deemed to be offensive cartoons. In 2005, Erdoğan sued Kart and the Cumhuriyet newspaper for “public humiliation” ― a cartoon that depicted the politician as a kitten in a ball of wool. The case was eventually dismissed. 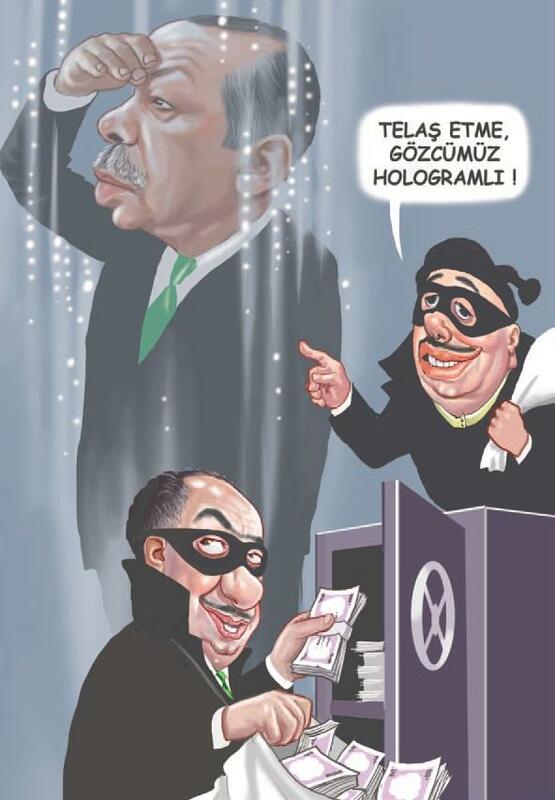 In 2014, Erdoğan took Kart to court for “insulting [him] though publication and slander” in another cartoon. That case was likewise dismissed. But Kart is now in prison with 10 of his colleagues from Cumhuriyet. In October, Turkish authorities raided his home and took him to jail. He has been held for months without trial. Last month, the government charged him with “abusing trust” and “helping an armed terrorist organization without being a member.” He is due to stand trial later this month. Investigative reporter Ahmet Şık was arrested in late 2016 for allegations he spread terrorist propaganda. He was subsequently accused of “publicly humiliating the Republic of Turkey, its judicial organs; [and] military and police organizations,” and was questioned about his social media posts. Ironically, Şık spent more than a year in prison in 2011 after writing a book that described alleged crimes by forces loyal to Gülen ― who was then an ally to the Turkish government. Deniz Yücel, a Turkey correspondent for the German newspaper Die Welt, became the first foreign reporter to be held in pretrial custody in the fallout of the coup attempt. In a recent interview, Erdoğan reportedly said Yücel is a terrorist because he interviewed a leader of the Kurdistan Workers’ Party, which Turkey considers a terrorist organization. German Chancellor Angela Merkel demanded Yücel’s release in March, and has vowed that her government will do “everything in its power” to secure his freedom. Activists, including Ognianova, are urging world powers to use their influence to defend and advocate for media freedom in Turkey. This article has been updated to mark the one-year anniversary of Turkey’s failed military coup.